NEW FEATURE ADDED TO PHOTO-OF-THE-MONTHSEE BELOW!!! 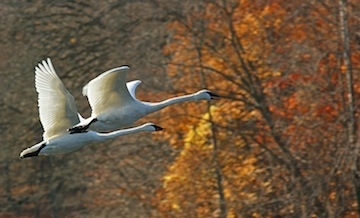 Mark’s image of the pair of Trumpeter Swans flying in front of the fall color shows a “planned” opportunity to share two very different subjects with the intent of highlighting the swans in the foreground. Mark focused his camera on the swans, which was the planned highlight in the photo. Each bird is in detailed focus including the eyes, wings and feet. When you look at the background of exceedingly bright-colored foliage, it is muted. This soft focus on the trees allows their color to come through and highlight the swans without the distraction of other objects stealing the focus. The composition of the birds on the left side of the photo is a slightly different interpretation of the rule of thirds. It is usually more appealing to the viewer to have the subject in either the left or right third of the photograph as opposed to the center. In fact Mark’s swan’s heads are dead center in the photograph, which would appear to refute the rule. But it is body of the swans that makes the rule of thirds work. The head and neck of both birds are such a small component of the photograph, and this creates the effect with the bird’s bodies fitting the rule of thirds! All of the above can happen with the focal length of the lens, but Mark saw the opportunity to put himself in a position to the have swans in the foreground and those trees in the background. And it worked with exceptional results! Waterfowl (including swans), cormorants, cranes and some shorebirds (and there may be other long distance diurnal migrants) utilize flight technics that essentially minimize impacts to the individual and spread the physical outlay to the other(s) in the flight. With Mark’s pair of swans we do not see them flying side-by-side or one directly in front of the other. We see the second bird behind and to the side of the lead bird. This helps in two ways: First they are minimizing any potential accidental contact while flying (this would certainly help in trying to escape a predator!). And second, the lead bird is “cutting” a hole in the wall of the air they are flying through. In other words, like automobile racing, the second car does not have to expend as much fuel as the lead car does to achieve the same speed. Of course they are built just a bit different than those cars, and it is because of the wings that they fly behind, but off to the side. When that lead birds tires a little, the second bird will head to the front and the lead bird than reduces the amount of energy it utilizes (aka taking a breather). Mark is a long time resident of the Lake Minnetonka area of Minnesota and has been taking photographs since the mid-1980s. Mark has taken several award-winning photographs and his work has been published in books and regional magazines and exhibited in local galleries. Mark has traveled extensively to numerous locations in the United States as well as many international destinations including: China, Egypt, Southern Africa, Thailand, Hong Kong, New Zealand, Fiji, Greece, Argentina, Japan, throughout Western Europe, various islands in the Caribbean, Central America, Mexico, etc. and has an extensive portfolio of photographs from these locales. We are pleased that Mark was willing to share this “keeper” shot in support of Trumpeter Swans and The Trumpeter Swan Society. Mike’s image of the Trumpeter Swan flapping its wings early on a misty morning provides us the prospect of how to use misty weather to enhance a photograph. Mike titles this “Angelic” and the ethereal feeling the mist adds to the picture has something to do with that title. First thing we notice beyond the swan is the bokeh (we discussed how to accomplish this in an earlier version of Photo-of-the-Month), that muted blue and white area in the background without any focus. The focal length of Mike’s lens adds to this, but the mist coming off of the river also softens the background and allows, actually makes the viewer focus on the bird. The effect of the mist on the swan is subtle, but really does add to the photo! First, notice that the eye and the rust on the head are tack sharp in focus, not being affected by the mist! This draws the viewer to the bird and makes the initial contact. The next aspect that your eye wanders to is the flight feathers or primaries on the wings. The feather shafts are all visible, the feather edges are almost crisp but not blurred and while the secondaries become a little muted. But when you look at the body feathers they are really muted without defined focus. All of the above can happen with the focus of the lens, but I think it is the mist that makes these features so “angelic”. And the reason for that is that the head and the breast/body feathers are on the same focal plane – or the same distance from Mike and his lens. So the breast should have the same focus detail as the head and eyes – it doesn’t! Mike saw the opportunity with mist rising from the river and used his capabilities as a photographer to create an outstanding photograph! There are a few reasons we see swans (and other waterfowl) rise up and flap their wings without taking flight. One could be that the swan had just finished preening and flapping the wings allows any “ruffled” feathers to fall in place. There is also the opportunity to shake any water from the feathers, whether from foraging, droplets from the mist or as Mike describes below, it just finished a short bath. There is also the thought out there that wing flapping shows dominance (perceived or otherwise?) relevant to other swans in the area. Any other thoughts out there as to why swans might do this? David’s image of this Trumpeter Swan family (and the cob with an easily identifiable neck collar band) brings up a challenge all photographers face, do you do post-processing and if so, how much? This is a wonderful shot! The pool of water holds the family together, as the pen and cob create “bookends” of protection for the cygnets. The consistency of the green vegetated background just adds to the formation of the “family” setting. It appears it was an overcast day as there are no hard shadows and that adds to the fine detail in bird’s feathers. Given the shape and size of pixels (as opposed to film grain), there is one step in post processing that should be considered, and that is a slight sharpening of the focus of the photo. It is just an intrinsic part of digital photography. Beyond that, altering the photograph with additional processing is up to the photographer. And with every photo there is always the story of the photographer, and as David explains below, he had a very personal involvement with one of the adult birds. And it is that involvement that gives it a personal touch and a story to share beyond the photograph. David Hoffman is a wildlife research technician with the Iowa DNR. 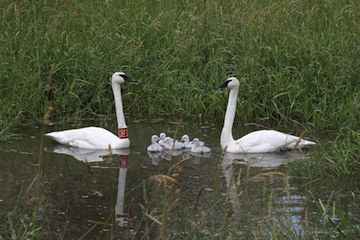 He has been involved with the Iowa DNR’s Trumpeter Swan Restoration Program since 1995. From David: “Trumpeter 7H2 is male hatched at Steve Nelson’s farm pond near Cherokee, IA in June 2004. His mother died shortly after his hatch. I cared for 7H2 and his siblings at my house for ~a week in 2004. Del Huebner of Clinton, IA cared for him till Sept. 2004. He spent the winter of 2004 at Laurie & Tony Severe’s Pond near Nora Springs, IA. and flew from their pond the following summer. The female is originally out of THE LIVINGSTON RIPLEY WATERFOWL SANCTUARY (Litchfield CT) http://www.lrws.org/ and she was hatched in ~1984. She nested from 1994-2003 at Von Maur Clothing Corp. office in Davenport. She also nested at the Lemke Funeral Home pond at Clinton, IA. She has only hatched successfully ~3 times since 1994, no more than 2-3 cygnets at one time. This pair is the first wild nesting pair in Winneshiek County Iowa since the late 1880’s!!! I heard the news that this pair had hatched cygnets. I stopped by to visit with the landowner (Langreck) and answer any questions about the Trumpeters and their care. I had my camera with, and was able to snap a few quick shots. We are pleased that David was willing to share this “keeper” shot in support of Trumpeter Swans and The Trumpeter Swan Society. 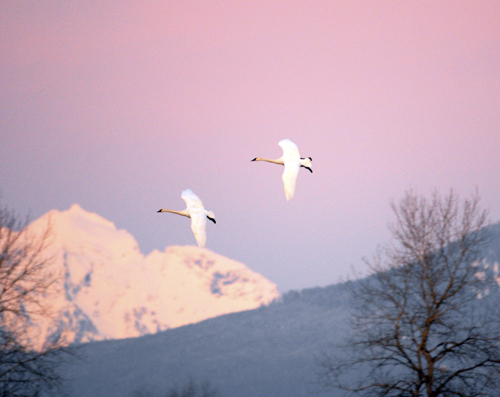 Stu’s image of the two Trumpeter Swans in flight with the sunset-tinged snow on Mt. Baker in the background shows how a very effective use of the camera’s ISO (the international standard measurement of sensitivity at which your camera’s sensor reacts to light when the shutter is open) can enhance the lighting on a photograph. The position of the swans in the photograph also gives a feel for some of the hardships these birds face in the wild! As Stu mentions below, the light was fading fast in the last few minutes prior to the sun slipping below the horizon for the day. We all know this light as the “sweet” light, but there are challenges photographing your subject in these low light situations, especially if you want some detail. Stu’s knowledge of ISO allowed him to adjust his camera’s sensor to accept more light, thereby creating a more realistic lighting of the birds. If shot at the “usual” 100 ISO (my standard ISO setting is 200), your camera would probably take the photo at 1/15 second, thereby creating a blurred, or out-of-focus photograph. Bumping the ISO up to 2000 allowed Stu to increase his camera’s sensitivity to light and have a sharper image. (One thing to remember about bumping up the ISO, the higher the ISO, the granier the pixels can look on most cameras – more on that in future articles). Stu was already aware of the lighting on Mt. Baker, which allowed him to concentrate on positioning the swans. Stu used the darkened ridge in the foreground and the two trees silhouetted in the sky to create a frame for the birds. The trees and the ridge effectively bring the viewer’s eye right to the swans in front of Mt. Baker! Even without Stu’s comments about time of year, we know these birds are surviving in a winter (the deciduous trees) scenario that involves lots of snow (Mt. Baker). This is a harsh environment for sure. All of this points to Stu’s knowledge of his camera’s mechanical limitations, the potential views of one of his favorite photographic sites, and his own capabilities to create an outstanding photograph on the spur of the moment! Stu Davidson is a lifelong native of the Pacific Northwest and now resides in just outside of Snohomish, Washington. He is a retired software Engineer of thirty years, is currently pursuing his lifetime passion of photographing nature and wildlife. From Stu: “Each winter I spend a good deal of time driving north from Snohomish to the Skagit Valley area of our state. The Skagit Valley, just south of Mount Vernon Washington, is an incredibly pristine area to see and observe large numbers of migratory birds. The birds that draw me to the area to photograph include: Bald Eagles, Golden Eagles, Hawks, Snow Geese, Canada Geese, Blue Herons, Tundra Swans, and Trumpeter Swans. This particular shot happened at the end of another great day of photographing wildlife in the Skagit Valley. Being winter, and getting late in the day, I was losing light quick! I began packing up my equipment to head home when I noticed the last of the day’s light lit Mount Baker in a nice soft hue, I thought “one last photo” before driving home. Because of the low light, I adjusted my camera’s ISO to 2000. As I began to position for a shot of Mount Baker, I caught a glimpse out the side of my eye of some large birds coming into “position”.. I recall feeling that my lucky day was continuing! A pair of Trumpeters on a landing approach graced my viewfinder!! We are pleased that Stu was willing to share this “keeper” shot in support of Trumpeter Swans and The Trumpeter Swan Society. 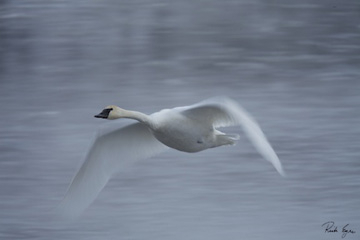 Richard’s image of the Trumpeter Swan in flight shows that having slightly less focused aspects of the subject can bring out the highlights you want to accentuate in your photograph. The soft focus on the wings helps in at least three ways: They push the viewer’s field of vision towards the head and the eye of the swan. The soft focus also helps transition the bird into the warm, subtle tones of the background. And the third point is that it gives a feeling of action and movement to the swan. We have gone back and forth over lighting issues on a white-colored subject. There are pros to bright, sunny days as the basis for the photograph and there are different positive aspects for photographs taken on warm, overcast days. What I enthusiastically appreciate about this photograph is the muted tones of the water in the background. There is no harsh blue contrasting with the softness of the swan, just an overall feeling of serenity in the lighting and the composition. All of this points to Richard’s capabilities in creating an outstanding photograph! Richard Eyre is a Northern Wisconsin based photographer specializing in unique, expressive landscapes and scenic images. His prints feature vivid colors and artistic composition to create captivating visions of the world. Rick has spent years exploring and photographing many diverse landscapes though-out the United States and around the globe. This swan was photographed along the Mississippi river in Minnesota last winter, on one of the coldest days of the year. Kip Ladage's Trumpeter Swan close-up. As in the past, I have talked about the challenge of lighting on a white subject that has black features. Kip did an excellent job of capturing the finest of detail in the feathers, which the black background only enhanced. And with a light-colored subject, that also allowed Kip to increase the depth of field. Another very nice quality of the photograph is that it is not the entire bird. The focal point of the bird is the head and the eye and with that being the case, just look at how the neck, wings and feathers pull the viewer’s perspective to that point. If the photograph included the entire bird or had a cluttered background, there would be a less focused feeling towards the focal point. All of this points to Kip’s capabilities to creat an outstanding photograph on the spur of the moment! Kip Ladage is self-taught nature photographer and writer residing in Tripoli, Iowa. His photos and writings have appeared in books, magazines, newspapers, posters, calendars, web sites, and television at the local, state, and national levels. His images have also been used in books, magazines, and web sites in the United Kingdom and Canada. Kip has presented numerous nature photography programs and workshops to people of all ages–from Kindergarten students to college classes, adult organizations, and residents of long-term care facilities. When not pursuing wildlife images, Kip Ladage enjoys backpacking, hiking, paddling his kayak, and riding his motorcycle. For more information, visit Ladage Photography on the web at: http://sites.butler-bremer.com/web/kladage/home.htm. Contact Kip Ladage via e-mail at: LadagePhotography@gmail.com. The fact that this trumpeter swan image even exists is based a bit on preplanning, good timing, ideal positioning, and much good luck. My wife and I were visiting the Iowa DNR booth at the Iowa State Fair. Outside of their booth is a small pond where injured and rehab waterfowl are on display for the public to enjoy. Included in the display were two trumpeter swans. I seldom travel anywhere without a camera of some sort. On this day we were carrying my wife’s point and shoot camera. I left my DSLR home since it is heavy and, after all, what is the likelihood of finding a nature photo subject in a sea of people at the state fair! While Kristy and I were watching the ducks and swans, this particular swan floated near us. I noticed it approaching and began tracking the beautiful bird with the camera as it approached. Just as the bird moved directly in front of us, it turned its head back and for a split second adjusted its feathers. During that brief moment in time I captured just this one image of the bird. Under normal conditions I would have been very frustrated that my wife’s camera was so slow, allowing only one image file to be created. However, in this case, the camera captured the special moment perfectly. Who could ask for anything more? Image details: Nikon P100, no cropping, image shown full frame. We are pleased that Kip was willing to share this “keeper” shot in support of Trumpeter Swans and The Trumpeter Swan Society. So many photographers are discouraged when they find their day in the field is overcast and cloudy. And in most respects, their subjects will look better on a bright, sun-filled day. But a white bird against white snow can create a photograph with high levels of contrast between the water, the bird and the snow. Max’s photo shows that an overcast day is actually an ideal situation for deadening the contrast that would have been readily evident on a sunny day. 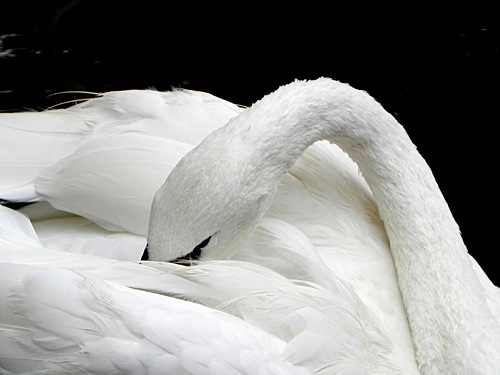 The composition of the photograph, with a clear area in front of the bird to fly into, takes advantage of allowing the swan to lead us into the setting of the photograph. With relatively close shots such as this, it seems to work better to have the subject mid-photograph on the vertical axis. When the subject is further afield that center placement is not nearly as critical. 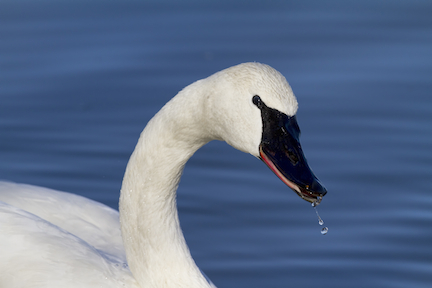 The drops of water in the air and the head and wings of the swan are all in focus, creating an action-filled photograph with great depth-of-field. With the out-stretched wings and splashes both in the foreground and behind the bird (along with the taking flight run of the bird), Max has created an outstanding photograph of an adult Trumpeter Swan against the background of steel-gray water and snow! Max Waugh is a part time nature, travel and sports photographer. He enjoys traveling around the world in search of wildlife, but always takes time to visit Yellowstone every year. Max’s family recently built a cabin near the park, which will hopefully be an excuse to spend even more time there. When he’s not on the road, Max lives in the Seattle area with his wife Jenn and their hedgehog Triscuit. We are pleased that Max was willing to share this “keeper” shot in support of Trumpeter Swans and The Trumpeter Swan Society. 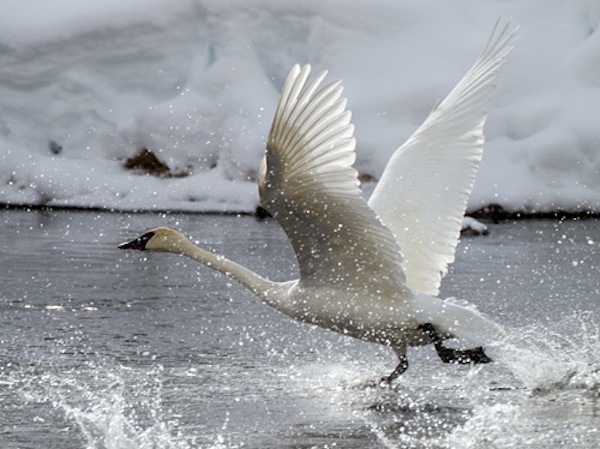 This month’s photo is a special one, just an amazing image from an extensive collection of Trumpeter Swan shots by professional Jess Lee of JessLeePhotos. Based on the Idaho side of the Yellowstone Ecosystem, Jess travels around the world. Trumpeter Swans are a favorite subject. 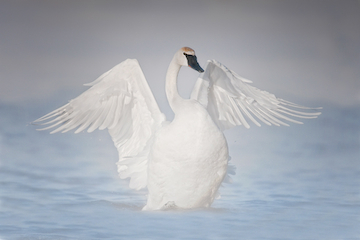 In support of The Trumpeter Swan Society’s 5-year Greater Yellowstone Trumpeter Swan Initiative, Jess Lee has generously donated this image as a LIMITED EDITION PRINT to TTSS. There will be 300 signed and numbered copies for us to offer to members and fans. 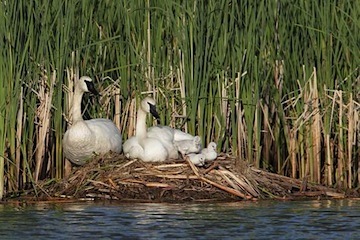 All the income from sales, except a small amount for production and shipping, will go to support TTSS’ 5-year Greater Yellowstone Trumpeter Swan Initiative. “Like I said, I think that as conservationist and wildlife advocates we have done a decent job of protecting and restoring large mammals such as Grizzlies and Wolves. While doing this we have allowed other grand creatures such as the Yellowstone Trumpeter swans to slip toward extinction from their traditional core range. As a photographer who has observed and wondered at the grace and beauty of these charismatic birds for over three decades, I find the increasing emptiness of Trumpeter Swans from their traditional breeding grounds in Island Park, Centennial Valley and Yellowstone as a real loss. YOU CAN ACT! Order a LIMITED EDITION of Jess Lee’s amazing image, and know that you’ve done something significant to help Trumpeter Swans. This print will make a great holiday gift as well. It is a wonderful way to give a beautiful gift, while putting your dollars to work to benefit the swans. Order your Limited Edition 12 x 18 print today! The cost is $235, which includes shipping and handling. Shop online with secure credit card payment, email us at ttss@threeriversparkdistrict.org or FAX your order in to 763-557-4943 today!